Today is Kees’ birthday. I asked him what he’d like to eat for his birthday. He said: “Pannenkoeken!” (Dutch for pancakes.) 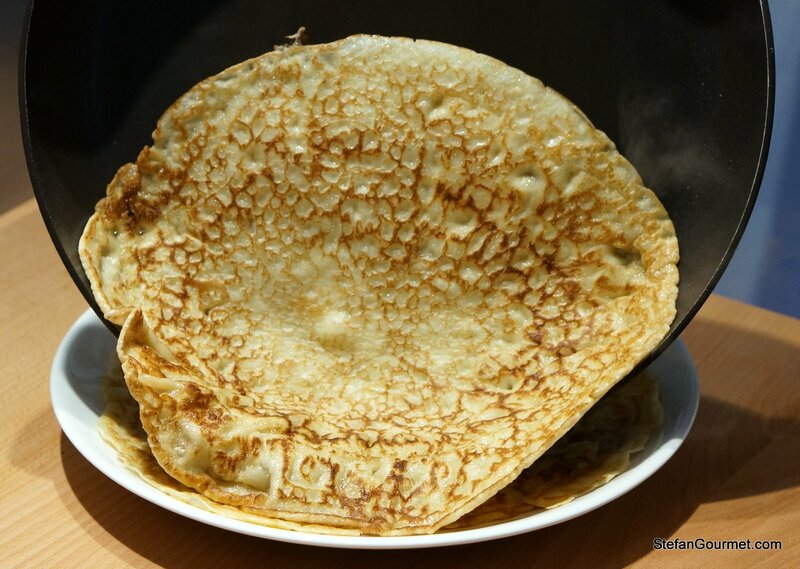 This is the same answer that most Dutch children will provide by the way 😉 Dutch pancakes are thinner than American pancakes and thicker than French crêpes. 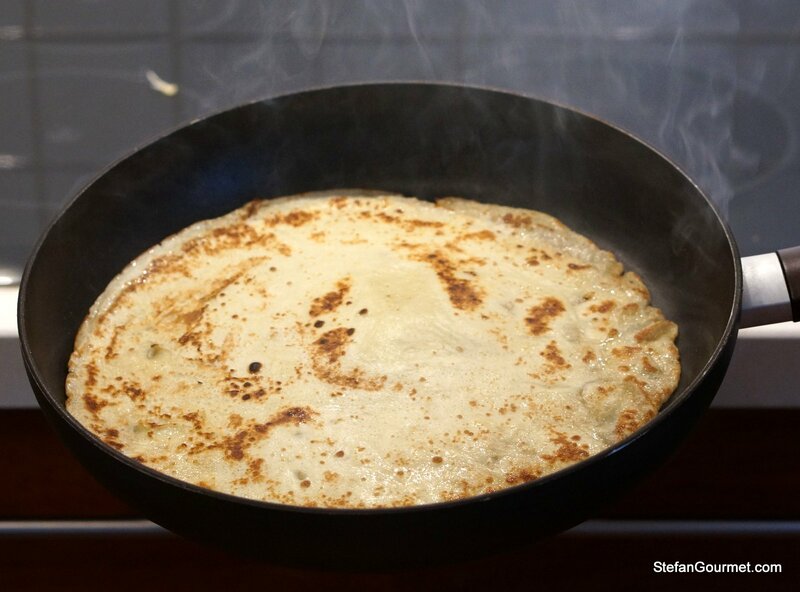 Dutch pancakes are not usually eaten for breakfast, but for dinner (for children) or lunch or dessert. They are most simply served with dark syrup (molasses) or plain sugar, with apple and cinnamon, or for a hearty lunch they are also made with bacon and/or cheese. 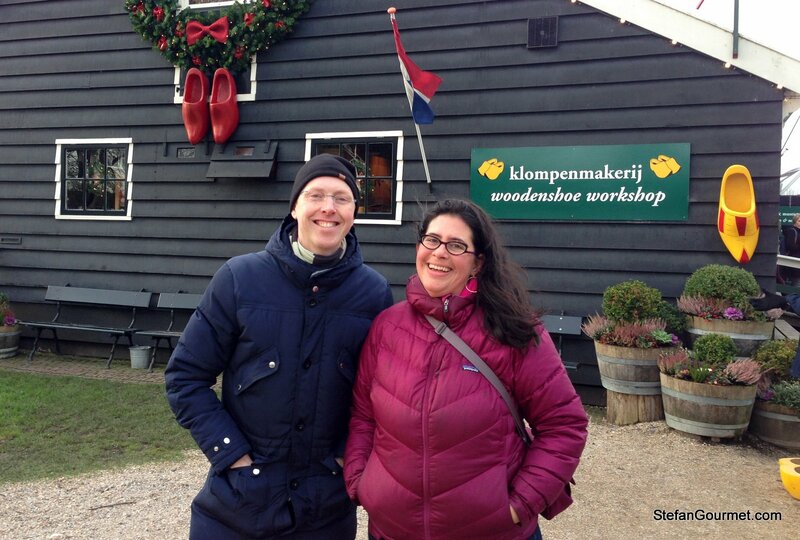 As a coincidence (or perhaps not) I had pancakes at the pancake restaurant of the Zaanse Schans yesterday together with EmmyCooks and her family, who I was showing around. I told Emmy that homemade Dutch pancakes are so much better than the ones served there. I just realised how much better exactly when I tasted one of the stack I prepared for Kees. Add about half of the milk. 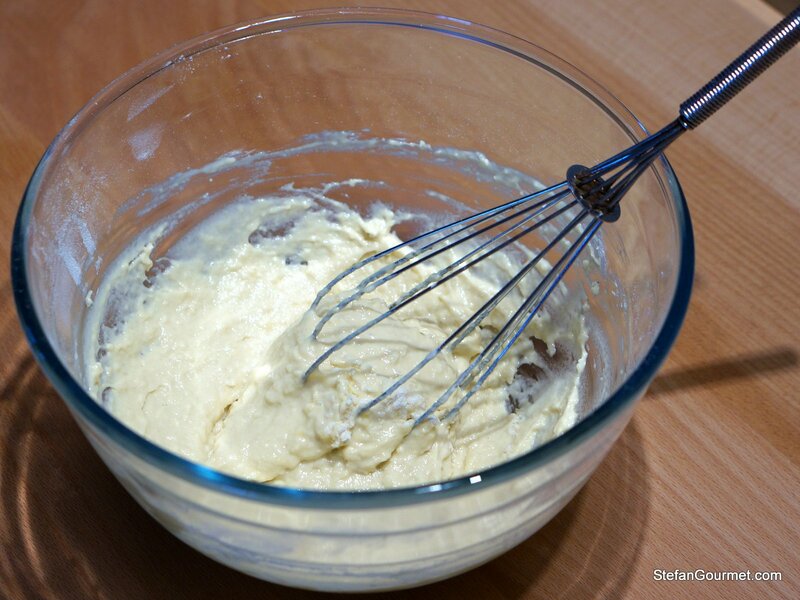 Whisk energetically until there are no more lumps. 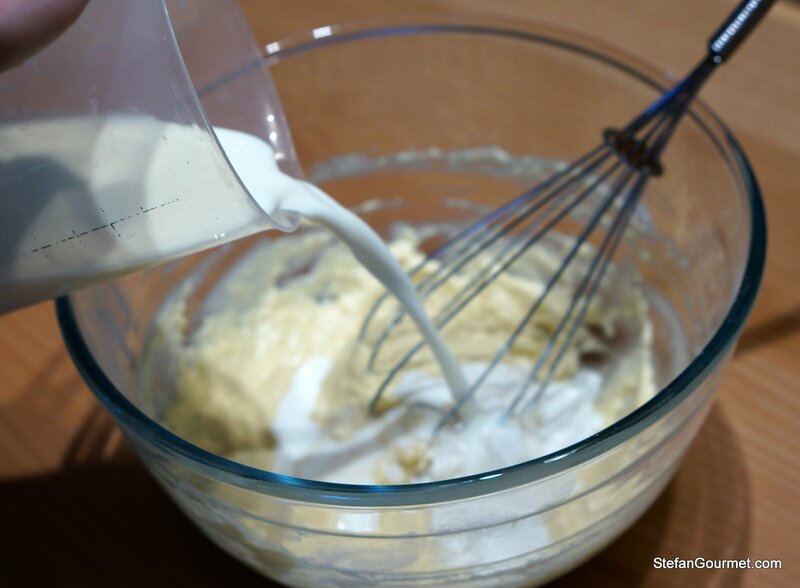 Slowly add the milk and keep whisking. The batter will be quite thin and should have no lumps. The technique to add half the milk first and add the rest slowly afterwards should help to avoid lumps. 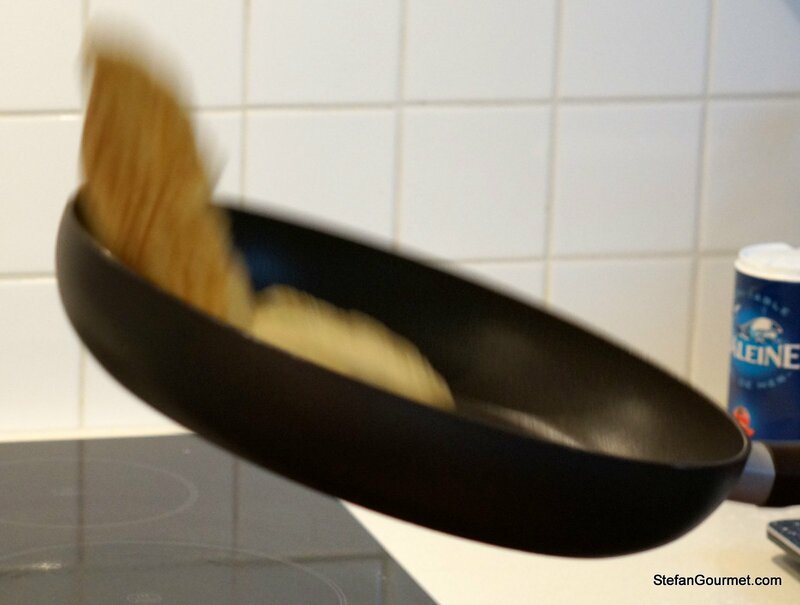 Distribute the butter around the pan with a wooden spatula or by tilting the pan (the latter only works with gas, with an electric stove the pan would cool off too much by picking it up to tilt it). 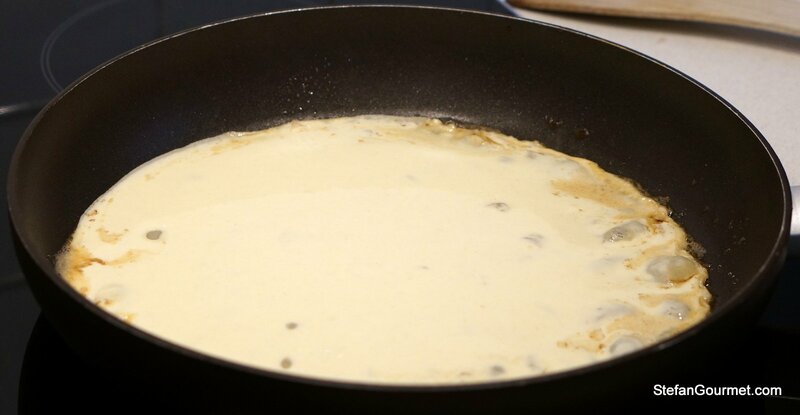 Pour in batter as soon as the butter starts to turn brown. 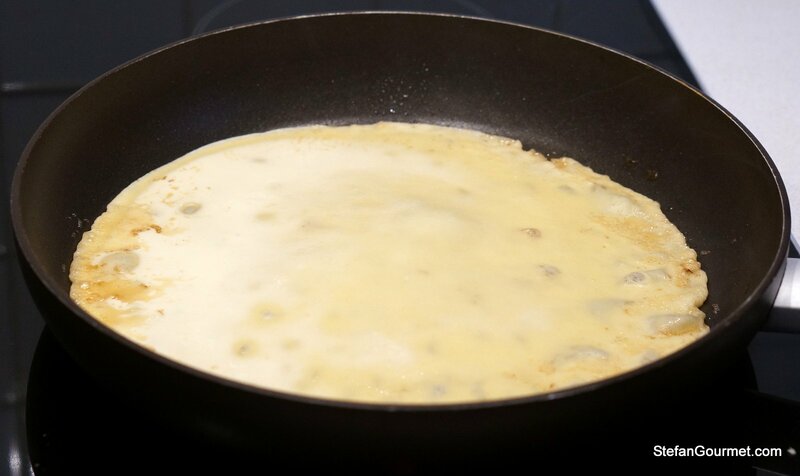 Pour all the batter in the center of the pan. 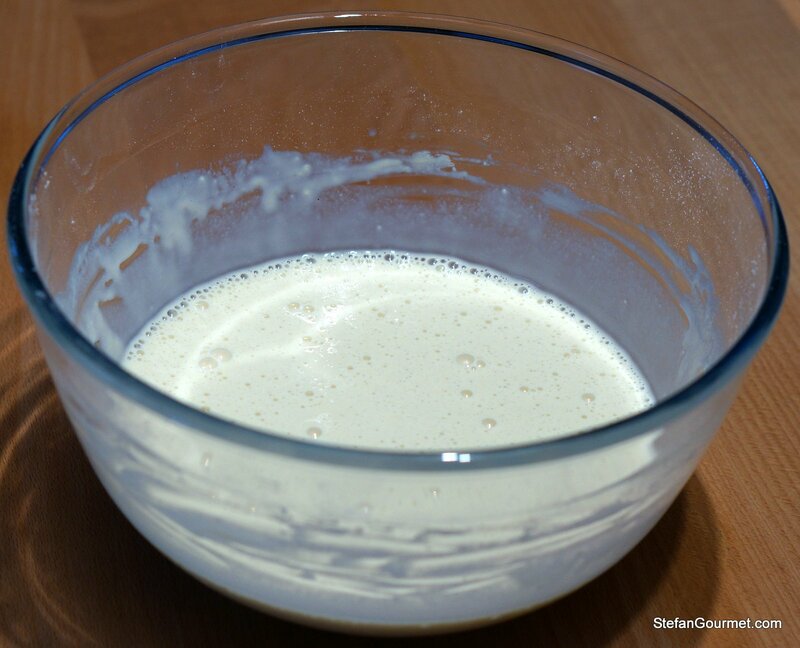 You need about 100 ml (6-7 Tbsp) of batter for a single pancake. 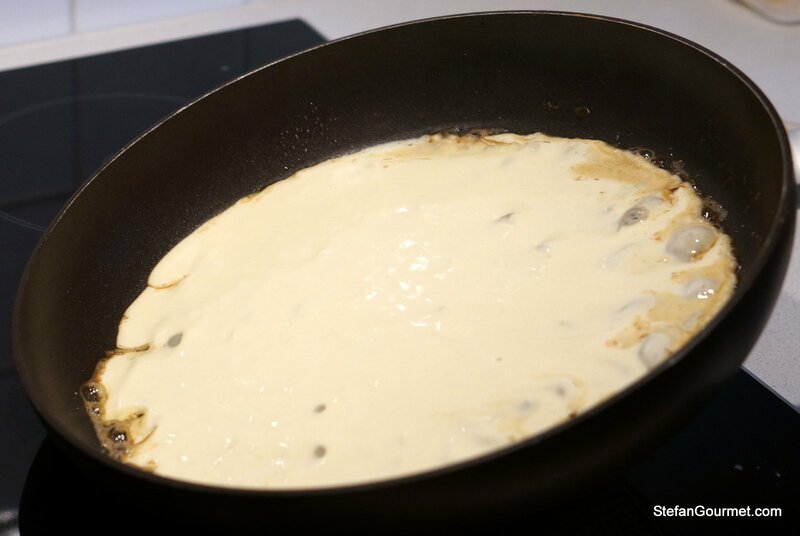 Tilt the pan to distribute the batter evenly all over the pan. 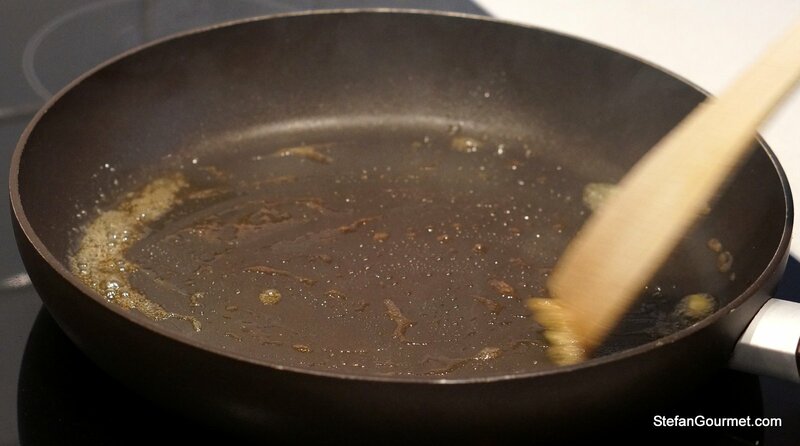 Put the pan down and allow to cook over medium high to high heat. 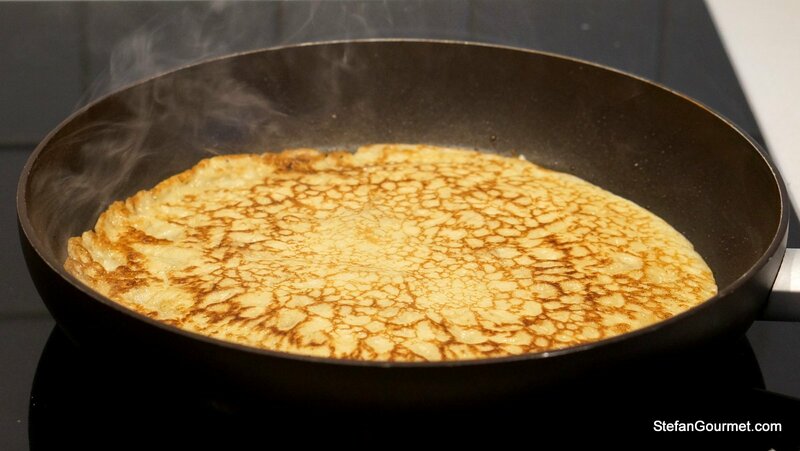 It is time to turn the pancake if the top starts to get dry and smoke starts to trickle from underneath. You can peek underneath using a wooden spatula, the pancake should be golden brown before you flip it. 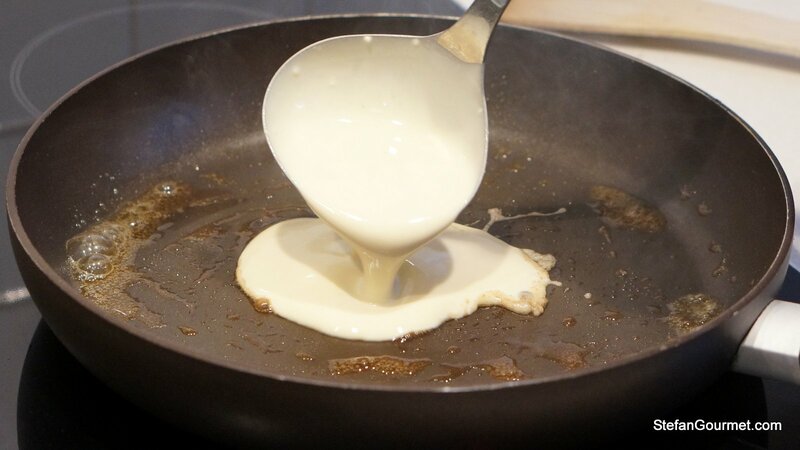 To flip the pancake, first shake the pan a bit and tilt it such that the pancake has shifted to the edge of the pan. 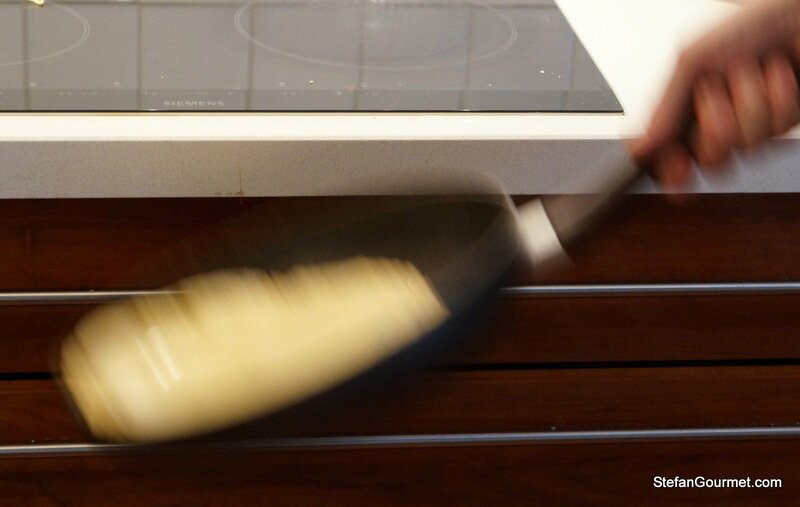 Flip the pancake into the air with a brusk motion. If all went well, you caught the pancake with the golden brown side on top. Cook the other side on medium high to high heat until smoke starts to trickle from below. Again you can peek with a wooden spatula. Here we flipped the pancake again just to show you that the underside does not look as nice as the top. That is normal and a good reason for serving the pancake with the ‘nice’ side up. 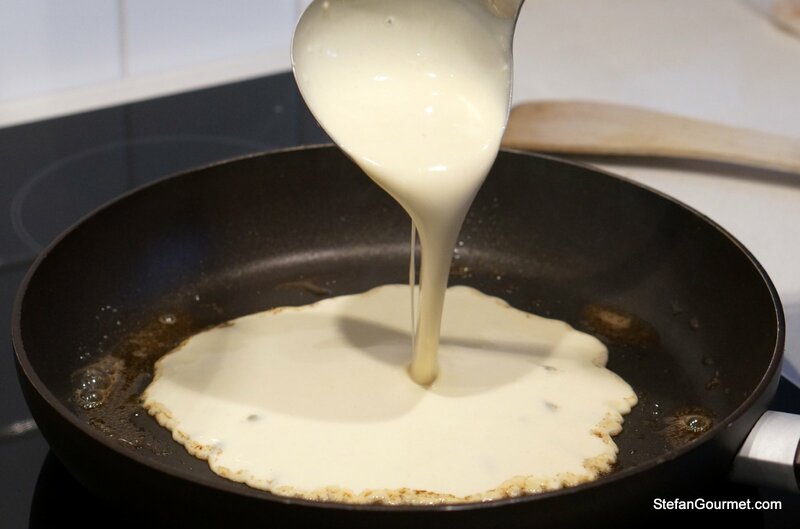 As soon as the pancake is done, let it slide onto a plate. If you keep sliding the pancakes on top of each other, you will create a stack that will stay relatively warm. You can always heat them up in the microwave if needed. 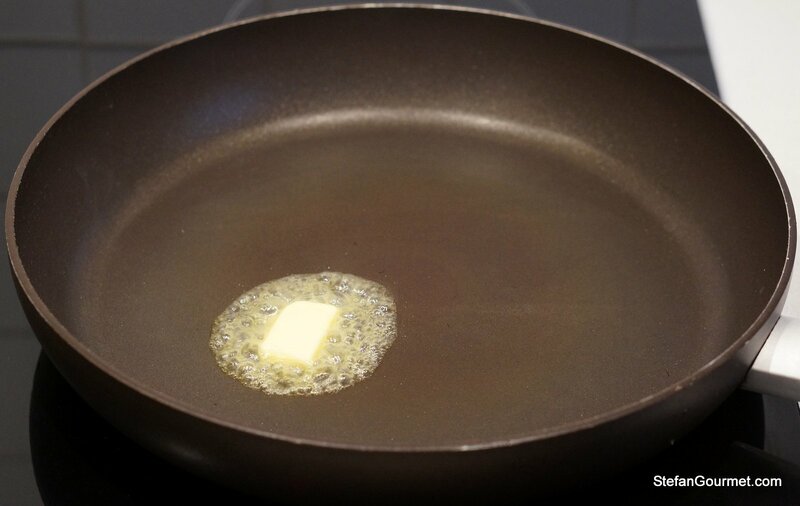 For the next pancake, start again with butter. The first is always the hardest, although it helps to preheat the pan. 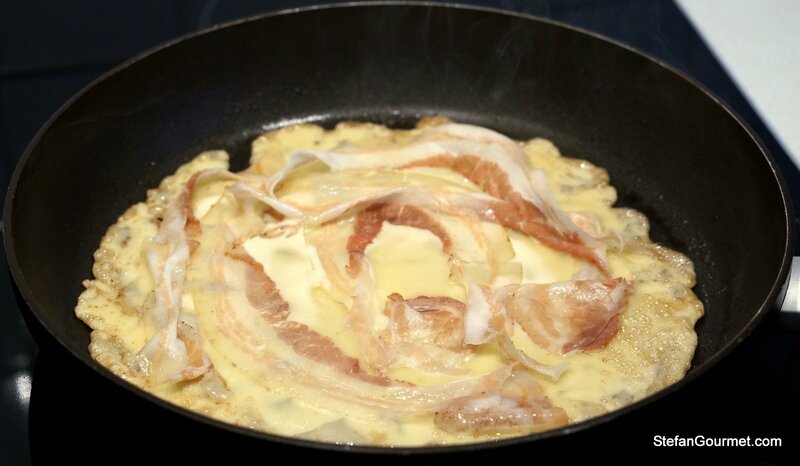 To include bacon, cheese, or sliced apple, add it to the batter right after it has been distributed in the pan so it will be fried along with the pancake when it’s flipped. 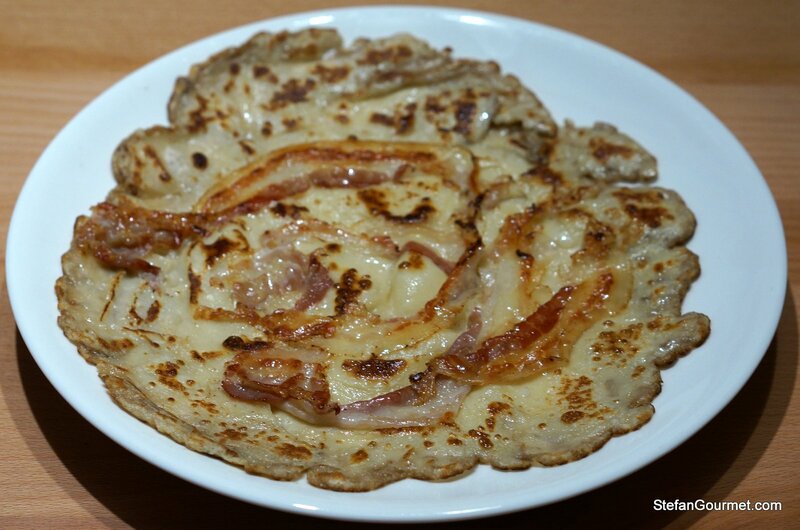 The pancake with crispy pancetta (not traditional but a lot better than plain Dutch bacon) was very tasty. 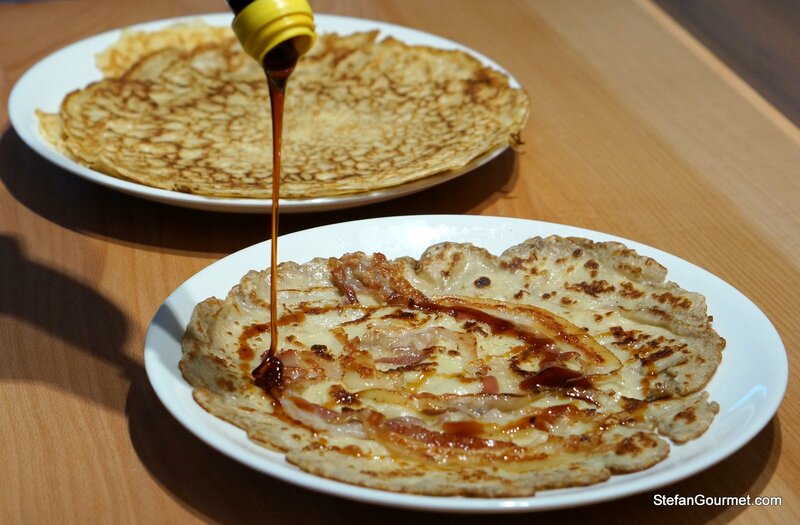 The caramelized sugar syrup known as “pannenkoekenstroop” (pancake syrup) is best, also on a bacon/pancetta pancake. 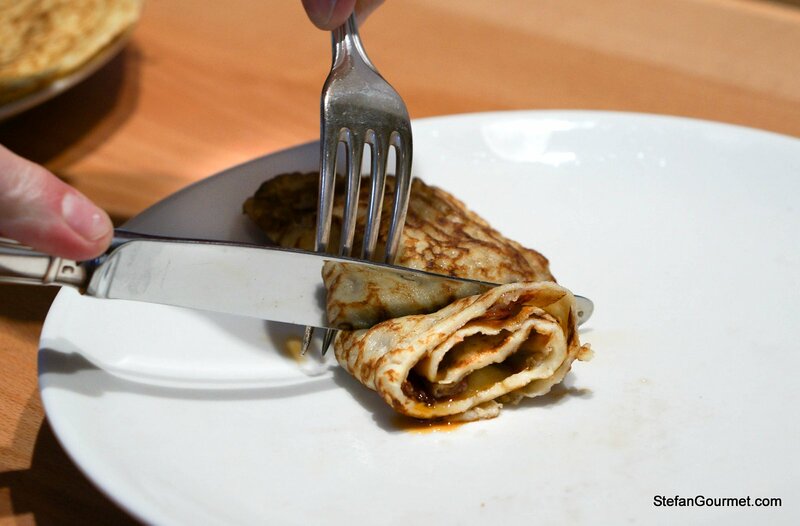 Dutch pancakes are usually rolled up and then sliced to eat them. Two years ago I did not provide a recipe, but a guide on how to shop for sea scallops. In the shell, out of the shell, or frozen? Sea scallops are one of my favorite foods, and if they are available to you in different manners it pays off to follow these tips. Great that you still use the old spelling with just one n. For me the new spelling still doesn’t make sense, even though it’s been around for 20 years or so by now. I’ve never heard of Hema kaassoufflébrood. Or did you mean a kaassoufflé sandwich? It is kaas soufle covered with pastry sheet in a bread form. I always have is for lunch..
What great shots! The pancake with the bacons looks delicious! So different than anything I’ve seen! Happy Birthday Kees! Great flipping shots – especially if you got them in one take! Kees was flipping the pancakes while I was shooting with the continuous shooting mode of the camera. I had dozens and these were the best of the lot. 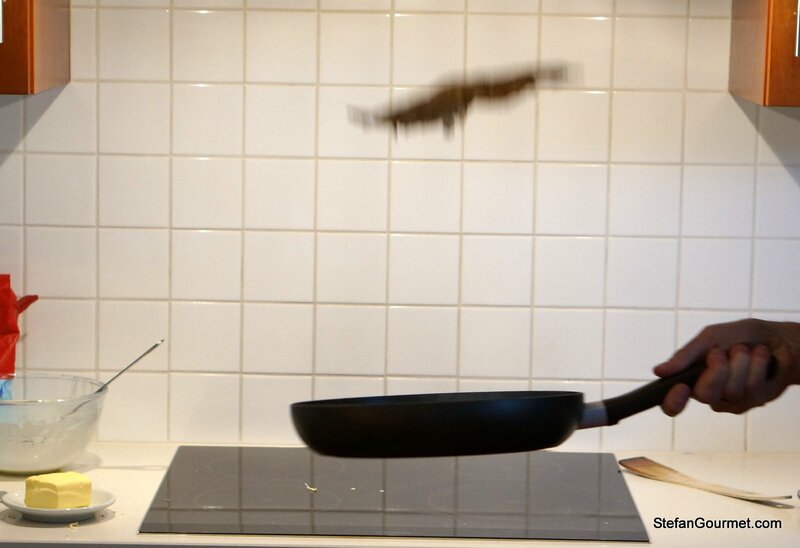 The gratuitous pancake flipping shots are pretty awesome. Our girls make pancakes this way (minus the bacon). They are pretty tasty. Best birthday wishes to Kees from the Wife and I. 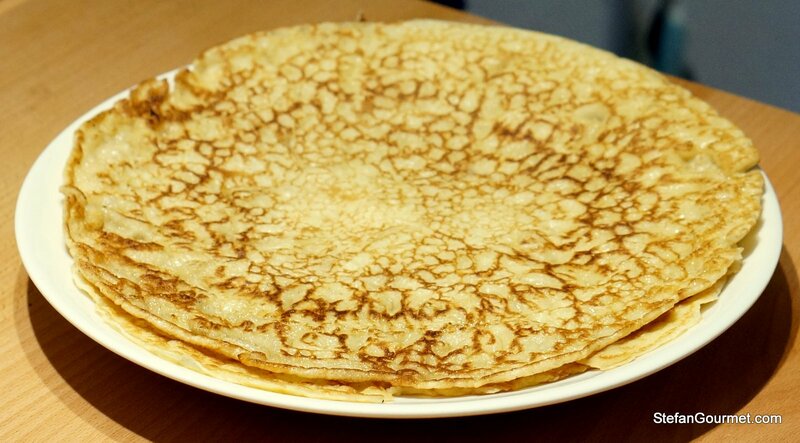 Now, to find some pannenkoekenstroop… the taste-testers I have in-house already. Thanks, Shanna. You always have such a nice way to express your thoughts. 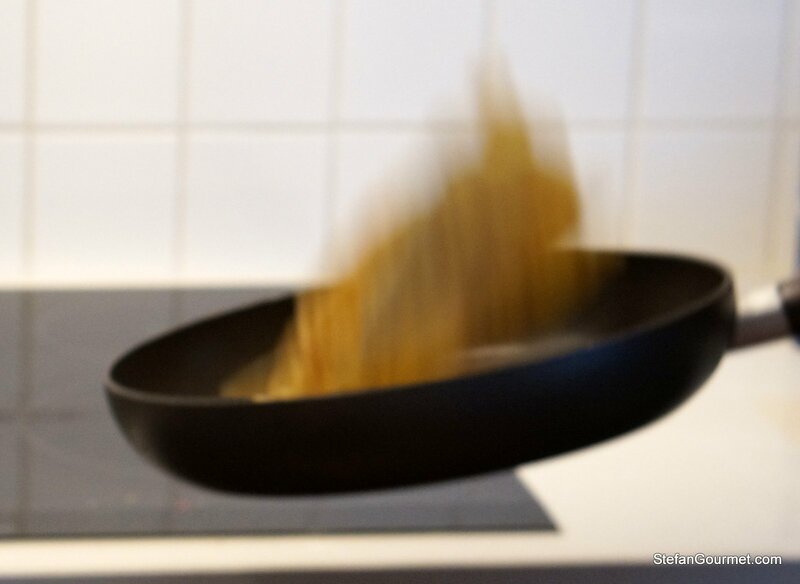 The pannenkoekenstroop is called molasses in the US, that should help to find it. Maple syrup wouldn’t be bad either though. Oh, molasses! Of course! Yes, we have this. However, it is extremely thick and not too sweet. I believe it is the leftover part of the sugar cane when it is refined. I use it in my gingerbread cakes and cookies. We do have nice Maple syrup from Vermont and Canada. 🙂 Thanks for the nice response. Thanks! By the way, that was basically how we made the pictures — using the continuous shooting mode of the camera. Try with fried cheese once! Hi Daniël, thanks for leaving a comment. That sounds like something worth trying as it would make the cheese crispy. Haha! Capricorn rules! 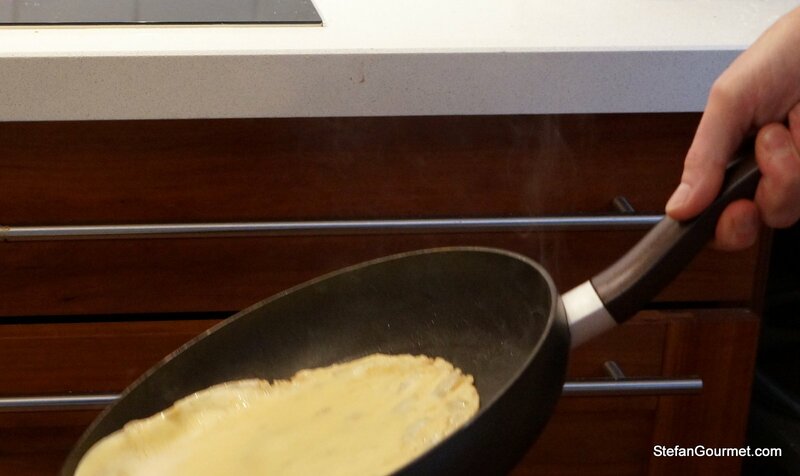 The best way to make pancakes for sure, just like the Aussie version served for dessert. My best wishes to Kees and a very happy New Year to both of you! The pancakes look wonderful . . . you are bringing my childhood back again as the Estonian ones look just the same in thickness and size and we call them ‘pannkook’ or plural ‘pannkoogid’ 🙂 ! Usually eaten with lingonberry, or, at a pinch, strawberry jam!! Thanks — best wishes to you too! As a pancake addict I will definitely be trying this! By the way, are you sure that the flour volume/weight conversion is correct? 250g for 1 1/2 cups means 167g per cup; I suppose it could be a difference between American and Dutch flours, but I’m used to 130-140g per cup depending on the brand. Hi Even, thanks for visiting and commenting. I use 160 grams per cup as standard conversion for flour. 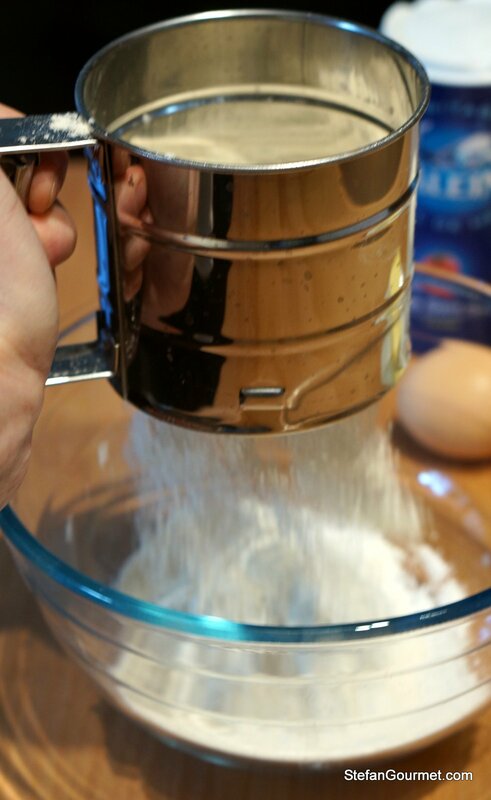 This is a standard used by more sources and I’ve confirmed it by putting a cup of flour on my digital scales. 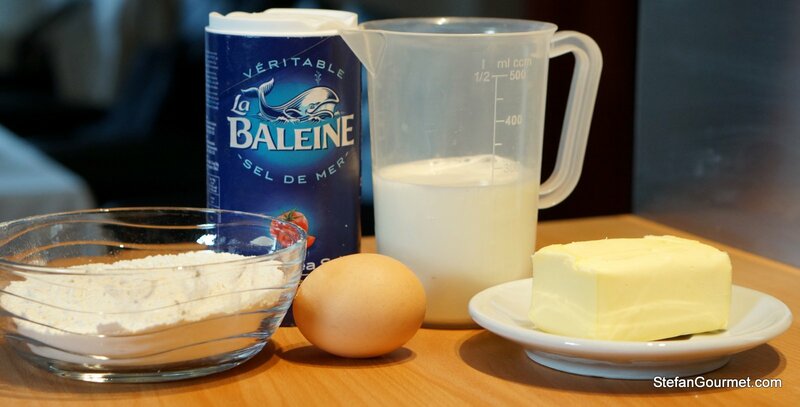 Personally I always use scales as that is the way to go; measuring in cups and tablespoons is not accurate enough for baking. On my blog the amounts in grams are the ones you need to look at, the amounts in cups are only a rough conversion. We followed the recipe exactly, with 1-1/2C flour and 2C milk (skim) and everything turned out great. Steve, thanks for reporting back! Thanks Francesca. 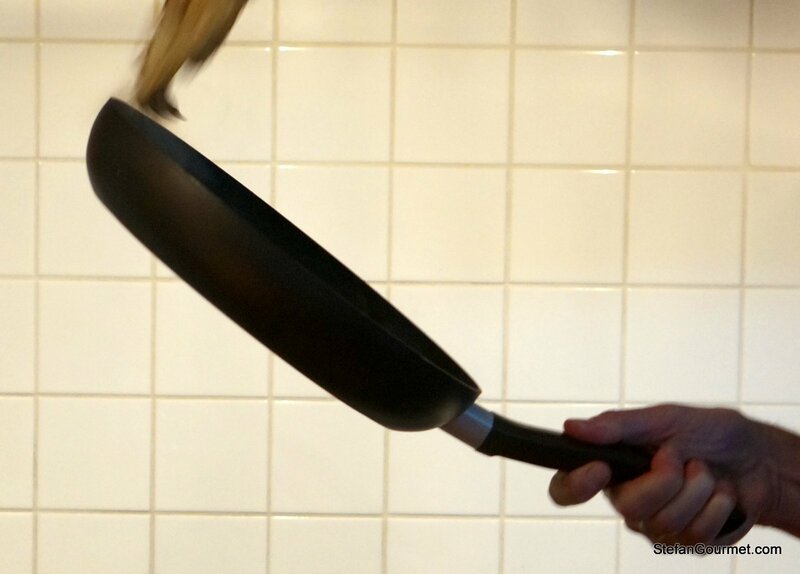 Flipping frittate is a whole different ballgame. I’ve only prepared frittate in the oven so far. Great post and congrats to Kees. Now we are all waiting for your take on the infamous “oliebollen”! I debuted with them yesterday following a recipe from NRC, with buttermilk and citrus zest. This provided a lightness and sourness that you will not find in commercial products. I wonder whether this would work for pancakes too. Thanks Jeroen, and Happy New Year! I’m about to post about the oliebollen I made last night. With lemon zest, but without buttermilk. For me the most important thing about oliebollen is not the recipe but eating them right after they have been deep fried, so they are still crispy. 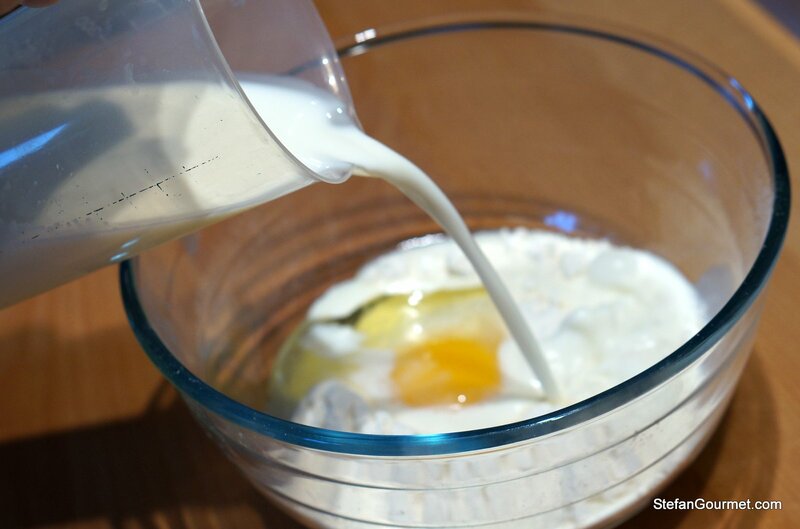 I’ve never tried pancakes with buttermilk, but I do know that many American recipes for pancakes include buttermilk. I will try to make this on the weekend, with cheese, ham, and mushrooms. We have an awesome restaurant in Calgary, Canada (Pfanntastic Pannenkoke Haus), where I first tried them. The De Bosrand is one of my favorites. 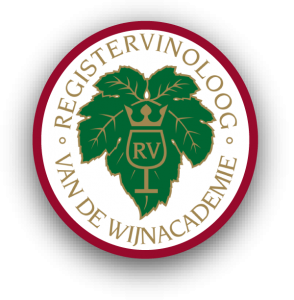 You should check out their menu – the chef and owner was trained in a specialized restaurant in Holland. Absolutely amazing pannekoken. Hi, I was planning to make this for an event, but I’m not sure they will remain warm the entire time. So, I was wondering, does the taste of Pannenkoeken suffer if they are not served warm? Thanks! Hi Rachel, yes it does suffer, both the taste and texture. The typical way to keep them warm is to make a stack and keep adding the hot ones on top. I would recommend to try and keep them warm around 60C/140F in a such a way that they can’t dry out (e.g. wrapped in foil). You could allow them to cool off and refrigerate them, and then reheat them, wrapped in foil, in the oven. Of course they are best when served straight from the frying pan, but that won’t be practical for the event. Hope this helps. There’s a place in Stowe, VT, USA, that makes these with a wide variety of toppings for breakfast. We made these for the first time today – with walnut halves and banana chunks. We are still trying to figure out the best way to cook them – so far, we’re adding walnuts to the pan just before the batter, banana chunks quickly after the batter, then flipping only briefly to the other side at the end. These thicker toppings hold the second side above the pan after flipping, and the bananas melt onto the pan somewhat. Nonstick pans are required in this case. Thanks for the recipe and post. Good stuff! Thanks. I recently made these pancakes with apple slices, and the flipping wasn’t easy. Walnuts must be even harder, so kudos to you! 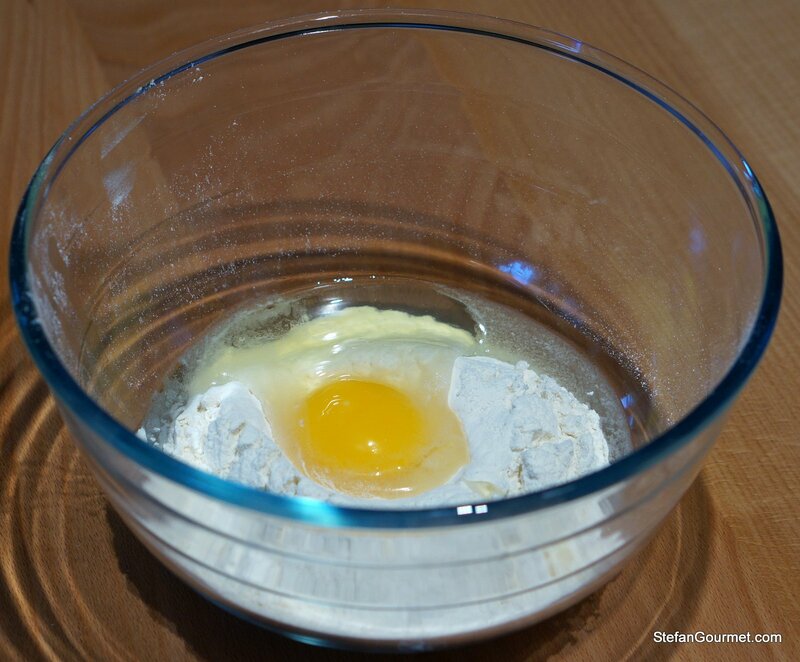 I used this recipe for our Shrove Tuesday pancakes yesterday. I bought a new pan so the flipping was easy. I used maple syrup. Would proper Dutch pancake syrup have been better? Is there a recipe for this on line? The apple pancakes were lovely but the pancetta ones really delicious.